David Bradley sits at an Arlington, Virginia, diner, his papers spread out in front of him. Dapper and courteous, he evokes a different era as he takes notes on index cards. The laptop on the banquette serves as a clue that the year is 2017, providing evidence that while Bradley’s manner may be from a bygone age, he’s firmly planted in the 21st century. When Bradley was just 26, he founded a legislative and regulatory research business. 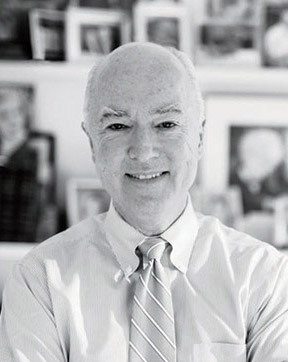 “I’d done nothing but study at that point,” says Bradley, who launched the Research Counsel while earning a law degree at Georgetown, “so I was comfortable with research.” As he pitched his services to companies in need of legal advice, he refined and expanded his business plan to focus on research in the financial services, health care, and corporate sectors. Over the next 20 years Bradley built and led the enormously successful firms that emerged: the Advisory Board Company (ABC) and the Corporate Executive Board (CEB). In 1999, having sold CEB, Bradley purchased the Atlantic, the monthly magazine that has explored American ideas since it was founded in Boston in 1857. At the time, print media was rapidly losing ground to its electronic competition, but Bradley was undeterred. “The happiest day of Mort Zuckerman’s career was the day I bought the Atlantic from him,” says Bradley with a laugh, noting that he was determined to save the magazine from its financial freefall. “The irony was that the thing ruining journalism—the Internet— came to our rescue,” says Bradley, who built an online presence that was profitable and complemented the print version, without sacrificing the quality and relevance that readers had come to expect. He has since expanded Atlantic Media to include several print and electronic brands. That leave-no-stone-unturned approach is a core principle that has guided Bradley’s life. It also facilitated the release of journalist Clare Gillis, a freelancer who had worked for the Atlantic and was held hostage in Libya in 2011. Bradley gathered interested parties—Gillis’s parents, journalists, lawyers—to brainstorm how they could help, and their initial success led him to bring together other families of hostages to strategize, collaborate, and support each other. While the outcomes have often been devastating, the families remain close. “It is a shared experience,” says Bradley, noting that one mother called him “our Schindler,” a compliment that still brings tears to his eyes. Among those often at the table brainstorming solutions with Bradley is his wife, Katherine. During their 30 years of marriage, the Bradleys have raised three sons, partnered to support public education in Washington, spent summers building a family treehouse, and regularly welcomed visitors to their Kalorama home for salon-style conversations. While David Bradley’s ambitions for the first 40 years of his life were to enter politics, he is now at peace with the fact that public office is not his calling. That peace is buoyed by his success as an entrepreneur, media magnate, philanthropist, father, and husband.